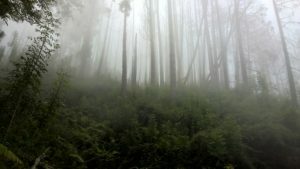 A redwood forest in Hawai’i? No way! Yes way! Believe it or not one of the best kept secrets is the redwood forest on the western flank of Haleakala Crater at 6200’ elevation in the Poli Poli Spring Recreation area on the island of Maui. It was planted by the Civilian Conservation Corps (CCC) in the 1920s and ‘30s as a reforestation project and the trees have thrived. Willis and I did an amazing and memorable sojourn to do a five mile loop hike in this enchanted forest in June 2017. For many years now our goal has been to hike in all 58 national parks. My records show we have done 35 thus far. Each one is unique and spectacular in its own right. Some of our favorite hikes include Walter’s Wiggles in Zion (Utah), the Highline Trail in Glacier (Montana), to the bottom of the Grand Canyon to stay at Phantom Ranch via the south Kaibab Trail and back up the Bright Angel Trail (Arizona), the hike to the Grand Ditch in Rocky Mountains (Colorado), and a 7-day high Sierras hike to the CCC camps in Yosemite (California). 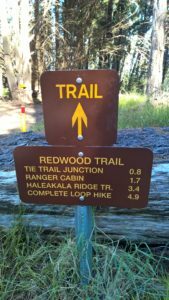 Along with these memorable hikes, we have now added The Redwood Trail in Haleakala on Maui. Just getting to this trailhead is half the “fun” if you like narrow, winding roads followed by a long unpaved and unmaintained portion with the deepest potholes ever. A 4WD vehicle is required. 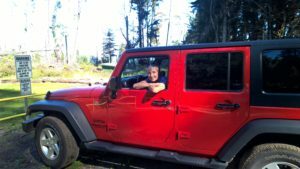 Never having driven a real Jeep, we opted for this red one which served us well. Here’s the trail sign – don’t let that fool you. Finding the start of the trail required all the hiking skills we have developed over the years. 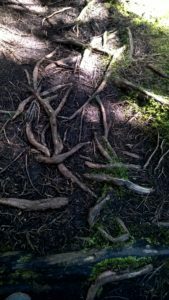 See how it is covered by tree roots. After hiking through a variety of trees including sugi, cedar and many other types (not native to Hawai’i – all of which have flourished in the climate at this elevation), we entered the redwood portion. Coming from California where redwoods abound in the north, we were impressed to see that some of these trees are around 100 feet tall, perfectly straight and with trunks up to six feet in diameter. Besides the drive to get to Poli Poli, there are two factors that make hiking the forest “interesting.” First, there are wild boars. Second, it is open season year ‘round to hunt wild boar with bow and arrow. When we first arrived at the parking lot, there were two young people having breakfast at the campground. We asked if they knew anything about the boar. “Oh yes, one ran through the campground last night,” said the young man. “Oh swell,” I thought. They had done no hiking – just overnight camping in a tent! Willis and I did a lot of “chatting” with one another throughout the hike in hopes of deterring any wild boar and to alert any hunters of our presence. We never saw another person during our hike…nor any boar; however, just knowing the possibilities encouraged a rather “brisk” hike. At this elevation, while the sun is shining it is spectacular. When the fog rolls in, it gets a little spooky. All in all, it is an excellent hike with 1,000’ elevation descent and then back up and across a ridgeline back to the campground. We are told there are some spectacular views; however, the fog limited that opportunity for us. 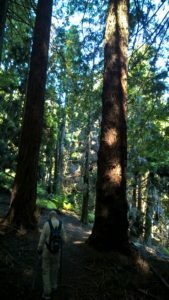 Just discovering this unexpected hike through a redwood forest on Maui makes this one of our most memorable hikes. One of the ways changing how I move has made a difference in my life is by allowing me to continue to pursue one of my great passions – hiking and exploring our national parks. Before integrating restorative exercise and nutritious movement into my daily life, I had to deal with backaches, shoulder and neck discomfort, and feet and knee issues both during and after hiking. I wondered how long I would be able to continue hiking. Now, I rarely have any problems despite the fact I am getting older. And, if there is a problem, in most cases I can figure out the cause and do something to alleviate and correct that issue. I no longer hike in rigid high-top steel-shanked hiking boots to protect my feet and ankles. Changing to minimal footwear for shorter hikes has strengthened these areas so I can do most hiking in more flexible footwear. I believe learning how to stand and walk in alignment and then adapting that to hiking has helped to keep me surgery free for pelvic prolapse over the past 10 years. I like the idea that I am doing something proactive to work on optimizing my physical health while totally enjoying adventures into unique and spectacular parts of our landscape. 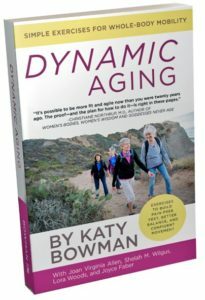 For more information on how to change the way you move, check out http://www.nutritiousmovement.com and our book, Dynamic Aging: Simple Exercises for Whole-Body Mobility by Katy Bowman, Joan Virginia Allen, Shelah M. Wilgus, Lora Woods and Joyce Faber 2017. Very interesting, my goodness, sure wouldn’t want to come across one of those wild boars. I always enjoy these blogs, but I never know who is writing it, you don’t seem to sign your name to it, or do I just miss it? Blogs are written by Joan unless otherwise stated.